CROSBY Over a hundred people turned out for a forum this week hosted by the Texas Department of Transportation in order to get a glimpse of Crosbys future. The purpose of the forum, said TxDOT representative Pat Henry, was to solicit community input for an upcoming state highway project. The project involves widening FM 2100 from two lanes to four lanes. The wider state highway would extend from Diamondhead Blvd. at the southern entrance to Newport to FM 1960 at Huffman. Preliminary plans calls for the new FM 2100 to be a divided highway with and outside shoulder, sidewalks from Diamondhead to North Diamondhead Blvds. and improved curves. The new road will feature a 45 MPH speed limit from Diamondhead north to Hare-Cook Road and 60 MPH limit from Hare Cook Road to FM 1960. Our main goal is to improve mobility in the area, Henry said. Henry added that the project would not only improve congestion but in upgrading the current highway it would improve safety issues. During the forum residents got their first look at a recommended alternative plan. This plan was developed following input from an Oct. 21, 2003 meeting. Opinions of the project expressed at the meeting ranged from a welcoming of the new road to distrust over right of way issues as well as those landowners who would see trees that have lined the roadways for years cut down to make room for progress. One proponent of the project who attended the meeting was State Rep. Joe Crabb. We have got to have more mobility, he said. So that people can get to school, work and shopping. Crabb added that as the population in Crosby continues to grow the need for a wider FM 2100 would only become greater. Henry said that once TxDOT collects citizen input they would begin creating an environmental impact study (EIS). The state expects to return to Crosby next year to get input for the EIS. Construction is expected to begin on the project in 2011 with completion estimated in 2013 or 2014. Those who would like to comment on the road but were unable to attend the meeting are urged to send their comments to Director of Project Development; Texas Department of Transportation; P.O. Box 1386; Houston, Tx,. 77251-1386. EAST HARRIS COUNTY Beginning Oct. 1 commuters will be able to take a Metro bus from the San Jacinto Mall to downtown Houston. Following the current METRO Route 236, the bus will pass through the Maxey Road Lot before proceeding to several stops in downtown Houston. Morning service hours will be 6:00 a.m. until 7:20 a.m. with departures every 25 minutes. Afternoon service hours, also with departures every 25 minutes will begin at 4:10 p.m. with the final pick-up at 6:05 p.m.
Harris County Precinct Two Commissioner Sylvia R. Garcia said that last week that the next step in providing Park and Ride Service between Baytown and downtown Houston has passed another hurdle. The Commissioners Court, on Sept. 11, approved three items necessary for the county to begin this first-of-its-kind service. The items approved unanimously allow for a grant to be accepted from the Houston Galveston Area Council (HGAC) in the amount of $124,020 for this pilot project. An agreement with SJM Realty, Ltd. was approved which allows the county to use the San Jacinto Mall parking lot as a pick up and drop off point in Baytown. The agreement with the Metropolitan Transit Authority of Harris County, in which Metro provides and operates the busses, was also approved. I am so excited as we finally near the beginning of this service next month, because this has been a long and difficult road. Moving from a starting point of no mass transit at all for East Harris County to a new Park & Ride route in Baytown is both amazing and a tribute to the hard work we have all put toward improving mobility in Precinct Two. Garcia said. 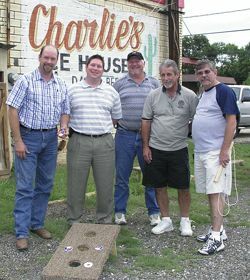 HIGHLANDS Rotarians were busy in this town as they hosted the annual Washer Tournament at Charlies Ice House, and then helped him celebrate his 15th year in business. The 2nd annual Washer Tournament is a benefit, to raise money for the Community activities of the club, according to president Charlie Ward. Approximately $7000 was raised in the event, with several hundred people turning out to participate in the tournament, the silent auction, or just to cheer on their favorite players. The event was held all day, last Saturday, Sept. 22, at Charlies Ice House on N. Main St.
Because the Highlands Rotary Club has such a strong reputation among the other 56 Rotary Clubs in the greater Houston area, for fun and successful fundraising, many city wide Rotarians turned out for this event. Blaine Springer was judged the Grand Champion Washer Thrower. First Place Team was Blaines Bunch; Second, Unstabalized; and Third, Unit 4. Rotarians also listened this week at their luncheon to Dr. Jeff Ackerman, CEO of San Jacinto Methodist Hospital in Baytown, who spoke on the history of the hospital, and recent improvements in the facilities and services offered. Since its inception in 1944, founded by Humble Oil, the hospital has served a large population in East Harris, Chambers and Liberty County that otherwise would not have access to good medical services. It affiliated with the Methodist system in 1983, and built its new bulding in 1988. SJMC now has 270 beds in 2 hospital buildings, and serves 15,000 admissions and 100,000 outpatients a year. There are 300 physicians on staff or affiliated, Ackerman said. He noted that the public perception of the facility has improved considerably, and that it now ranks in the top group of Houston hospitals in many ratings. He noted that recent Initiatives have included a Cancer Center, Stroke Center, Cardiac Rehab, and soon a Chest Pain Center. While preparing breakfast for the Mrs. this morning, there was a double yoke in one of the eggs. Having seen this several times before being the chief cook of the house, its no big thing but does it mean anything? Maybe more yoke for the buck? Probably not but I ran it through Google and discovered one site says supposedly it means someone in my family is going to die. Hog wash, pure and simple! My right hand itched this morning as well, so what does that mean? Actually it was the side of my hand, not the palm, so close but no cigar maybe? Again searching Google, a site says I am to come into money. Hummm, sounds interesting. Another site mentioned the possibility of having a pinched nerve and to see a doctor. Another says if it is your right hand that itches then money is coming to you, but dont scratch it because that stops the money from coming. Additionally if your left hand itches then scratch away cause you will soon be paying money. Or your hand could be dry and in need of moisturizing. Ho hum you say? How about when your nose itches, what does that mean? One response says you are going to kiss a fool, while one says you are going to have a fight. Then one says you are going to be visited by someone unexpectedly. This gets better as one site says that the person you like is thinking about you or talking about you. Another says when your left hand itches you will hear from an old friend and the right hand indicates you are getting money. This is no doubt superstition, but then again an interesting topic. For instance, what do they say about somebody whose eyebrows meet? Trust not the man whose eyebrows meet. For in his heart you will find deceit. You believe that? How bout when your ears are burning? Mean anything? Maybe somebody is talking about you. Also says small ears denote a delicate character and thick ears indicate a person of sensual/coarse nature. Thin angular ears mean a bad temper while a long prominent ear is of a person with musical inclinations. Would a prominent ear include someone who has ears that look like a car with the doors open? The larger the ear lobe, the greater the intellect. Lets not forget the lips and teeth. The lips will itch or tingle when someone is about to kiss you. If you bite your tongue while eating, then you have recently told a lie. A large gap between the teeth means lucky in life; Large teeth mean physical strength while small, regular teeth mean careful and methodical in their habits. Also, never eat anything when a funeral bell is tolling or a toothache will follow. Its supposed to be unlucky to cut fingernails on a Friday or Sunday. Itching feet means a journey to somewhere new. Flat feet indicate bad temper. To avoid bad luck, do not enter a building left foot first to avoid bad luck. Sneeze once for a wish, twice for a kiss, three for a letter, four for something better. If you buy a broom or brush in May, youll sweep the head of the household away. Crows  One is bad, twos luck, threes health, fours wealth, and fives sickness and six is death. If a plow kills a daddy long legs the cows will go dry. If you have young children, you may want them to attend college someday – and you may want to help them pay for it. At the same time, you also need to save for a comfortable retirement lifestyle. Are the two goals compatible? Theres no easy answer to this question. But one thing seems clear: For many parents, saving and investing for their childrens future is every bit as important – and maybe more so – than saving and investing for their own. In fact, two-thirds of parents said they would postpone retirement if necessary to help pay for their childrens college education, according to a survey by Alliance Bernstein Investments, Inc.
Parents have good reason to believe that investing in a college education will pay off for their children: Over the course of their lifetimes, college graduates will earn, on average, about $1 million more than high school graduates, according to the U.S. Census Bureau. So, since a college education appears to be quite valuable, shouldnt you do everything you can to help pay for it? Ultimately, youll have to weigh your potential college contributions against your need to save for your own retirement. On one hand, youd like to help your children as much as possible; as a parent, you dont want your children saddled with enormous debts when they leave college. But on the other hand, that type of reluctance may be based more on emotion than on a sound financial strategy. After all, college graduates seem to find a way to eventually pay off their loans. Furthermore, your children may be able to find grants, scholarships and work-study opportunities. Many students can earn a decent amount of money at summer jobs, too. Nonetheless, you still may feel obligated to pay something toward your childrens college education. But if youre going to help pay for college, be smart about it. For example, think twice before borrowing from your 401(k). Such a move will slow the growth potential of your retirement funds and it could prove costly in other ways, too. For one thing, if you leave your job, voluntarily or involuntarily, youll need to repay your 401(k) loan completely, usually within 60 days. If you cant, the balance will be considered a taxable distribution – and you may even have to pay a 10 percent penalty on it. Instead of tapping into your 401(k), IRA or other accounts youve designated for retirement, look for other ways to help build your childrens college funds. You might decide to open a Section 529 plan, which offers tax-free earnings potential, provided the money is used to pay for higher education costs. You can put whatever you can afford into a Section 529 plan, along with gifts from grandparents or other relatives. Contributions are tax-deductible in certain states for residents who participate in their own states plan. Please note that a 529 College Savings Plan could reduce a beneficiarys ability to qualify for financial aid. You might also want to consider a Coverdell Education Savings Account, which offers another tax-advantaged way to save for college. As you already know, much of your life involves balancing acts of one type or another, so you should be able to handle one more – college for your kids against a comfortable retirement for you. By making the right moves, though, you may be able to reach an equilibrium that works for everyone. HIGHLANDS At their monthly luncheon, the Highlands Chamber presented service awards to local public safety officials, and community leaders in an annual tradition. The top award is the Terry Davis Award, named for a person each year who gives outstanding service to the community, beyond what is necessary to make a difference in the Community. 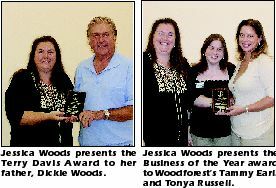 Chamber president Jessica Woods said that she was honored to be able to award her father, C. R. Dickie Woods with the Terry Davis award. Dickie was cited for his leadership, support of community activities including the Chamber and Rotary, and outstanding business practices in the community, including many years as owner of several key businesses. Another key award is to the Business of the Year. This went to Woodforest National Bank, for their participation in Chamber activities, and support of community events. The award was presented by Jessica Woods, and accepted for the bank by Tonya Russell and Tammy Earls. Outstanding Sheriffs Deputy, to Deputy Gordon Trott, Jr. who made over 1500 calls for service over the last 12 months. 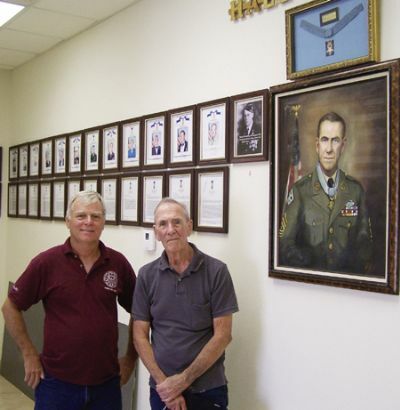 The award was made by his Captain, Mike Talton, who also paid tribute to Gordon Trott, Sr. for his service in the military, specifically at Iwo Jima during World War II. Outstanding Constables Deputy, to Herman Eagleton, for his work in making a large number of drug arrests in his 7 years on the force, helping to eliminate a community problem. The presentation was made by Constable Ken Jones and Capt. Gary Jones. Outstanding Firefighter of the Year, to William Tommy McMorrow, who also serves as a deputy constable as well as a volunteer firefighter. Fire Chief Harvey Little cited McMorrow for his work in keeping the communications equipment of the department up to date. The Chamber also presented a check for $500 to Principal Karen Thomas of B. P. Hopper Primary School, who is the Partners In Education school for the Highlands Chamber. Kristi Stallings, PTO president and Chamber president Jessica Woods made the presentation to the Principal. 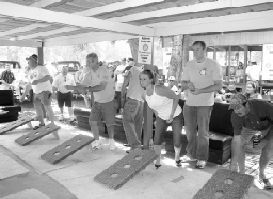 HIGHLANDS The Rotary Club of Highlands will hold its 2nd Annual Washer Tournament this Saturday, Sept. 22nd at Charlies Ice House at 906 N. Main Street. Two man teams will compete, with 50 teams signed up, according to Rotary President Charlie Ward. In this double elimination tourney, the top 3 winning teams will receive Prize money and bragging rights for a whole year. Rotarians from around the Houston district are expected to attend, including District 5890 Governor Jeff Tallas. The public is invited, and can participate in the silent auction, food and drink. Proceeds from the tournament will go to the Rotary Foundations Annual Program Fund, which includes scholarships and other community programs. It seems I am frequently among the last to know! Such is life! In the September 13th issue of the Star-Courier, my good friend and fellow newspaper buddy, Bobby Horn, Jr. asked the question Where were you on 9-11? As with you it brought back some memories, in this case not many years ago but it also took me back many years about other, Where were You? questions. On September 11, Im sure I was among the last to know about that tragedy. As I recall the first plane hit the New York tower shortly after 9 a. m.( EST). I did not know about the event until just a couple of minutes before noon EST. Ive been retired from Union Carbide Corporation (a large chemical company of that day) since 1991. A few weeks before 9/11 some UCC officials had asked about 30 of us, all retired, to meet with a couple of company reps and discuss improving communications between UCC and its retirees. We met in a large conference room in a company building but only a couple of people knew we were there. We had entered the facility about 7:30 a. m. (EST). When reports of the attack began, since no one knew we were there, we were not told. Not until we emerged a few minutes before noon to go to the cafeteria for lunch did we find out what had happened. As we walked into the lobby of the building it was filled with people watching on a couple of available TV sets. Like you, we were astounded. Our work had ended and only lunch was left. Some of us skipped this free lunch and headed for home. Once there I watched the events on TV for the rest of that day and into the next. Bobby made me feel old in his written word of the last issue. He mentioned being too young to answer the question, Where were you when JFK was shot? I can well remember, as I was sitting in a Workmans Compensation hearing at the Statehouse with several attorneys dealing with compensation problems. I stepped out of the hearing chambers for a soft drink and got the news. I returned, told the group and the hearing was immediately stopped. The question Where were you when Pearl Harbor was attack? was the first memorable Where were you, of my life. That was a Sunday and my mother, dad, a cousin who was visiting with us, and I had all gone to church that morning, had finished Sunday dinner and I was sitting at a table with my mother and cousin playing three-handed bridge. My mother was a bridge player and at eleven I was learning the facts of bridge. Those are the three memorable historic occasions of my life that are still quite clear. Other where were you questions concerned President Roosevelts death while in office, D-Day, the day World War II ended and the day President Reagan was shot but not killed. They still stick in my mind but have less significance than the top threeparticularly Pearl Harbor. Your school days may be behind you, but that doesnt mean you shouldnt test yourself on various subjects from time to time. And one of the most important topics you can study is Retirement Planning. So, take a couple of minutes to take this quiz. The answers – and even the questions – may prove valuable to you as you save and invest for retirement. Have you put a price tag on your retirement lifestyle? All of us have different ideas of the ideal retirement. Your brother may plan to travel the world, your sister may want to open her own small business and you may choose to volunteer. Once you know how you want to spend your retirement years, you can calculate about how much your retirement will cost. A financial advisor can help you arrive at a good estimate of how much youll need to spend per year. Do you contribute to your 401(k) or other employer-sponsored retirement plan? If you have a 401(k) or similar plan where you work, youll receive several key benefits by contributing. First, your money has the potential to grow on a tax-deferred basis, which means it can potentially grow faster than if it were placed in an investment on which you paid taxes every year. Second, you typically invest pre-tax dollars, which means your contributions can actually help lower your annual taxable income. And third, you can spread your dollars among a range of various investment choices. Do you boost your 401(k) contributions every time your salary increases? If you dont, you should. Your annual 401(k) contribution limits are pretty high: $15,500 in 2007, or $20,500 if youre 50 or older. Obviously, the more you contribute, the greater your chances of achieving your retirement savings goals. Do you also contribute to an IRA? Even if you contribute to a 401(k), you can put money in an IRA. A traditional IRA has the potential to grow tax-deferred, while a Roth IRA offers tax-free earnings potential, provided youve had your account at least five years and you dont start taking withdrawals until youre 59-1/2. (Income limits apply to the Roth IRA, however.) In 2007, you can put in $4,000 to an IRA, or $5,000 if youre 50 or older. And you can fund your IRA with a variety of different investments. If youre self-employed, have you set up a retirement plan? If you work for yourself, or run your own small business, youll need to set up a retirement plan. Fortunately, youve got many attractive options, all of which offer tax deferral and a range of investment choices. Depending on your situation, you can establish an owner-only 401(k), a SEP-IRA, a SIMPLE IRA or a Keogh plan. Your tax advisor can help you select the plan thats right for you. Have you explored other retirement savings vehicles? If youve maxed out on your IRA and your 401(k) or self-employed plan, and you can still afford to put away more for retirement, youll want to explore other investments, such as annuities, which offer tax-deferred growth potential and have very high contribution limits. Theres no passing or failing grade to this quiz – but if youve answered yes to all the questions, then youre probably putting yourself in a good position to ultimately work towards your retirement goals.